It’s entirely logical for narcissists to seek alliances with authoritarian leaders. President Vladimir Putin and President Donald Trump meet in Hamburg, Germany on July 7 2017. Credit: en.Kremlin.ru. CC BY 4.0. After leaving allies rattled at the NATO Summit in Brussels and dodging mass protests in the UK, Donald Trump is now traveling on to meet with Vladimir Putin in Helsinki—a meeting he has said “may be the easiest of all.” Trump’s boorish behaviour in Brussels fits a now well-established pattern of attacks on democratic allies and praise for authoritarian leaders that has left the rest of the world struggling to make sense of his seemingly incomprehensible conduct. Viewed from the perspective of Trump’s possible mental state, however, his foreign policy makes perfect sense. While a range of conditions have been mooted by mental health professionals as possible explanations for Trump’s disturbing behaviour, the condition that most concerns these psychiatrists is a disorder known as ‘malignant narcissism.’ This disorder combines extreme narcissistic behaviour and acute paranoia with the absence of conscience that is usually exhibited by psychopaths. One of the distinguishing traits of malignant narcissism, as the psychiatrists’ letter to President Obama noted, is a hypersensitivity to slights or criticism, which results in what is known as ‘narcissistic rage’ towards anyone who disagrees. When exhibited by someone in a position of power, this would manifest as a kind of fury towards one’s political opponents, the press and the courts, together with active measures to curtail their dissent. A third feature of malignant narcissism is perhaps the most dangerous aspect of the condition, namely an inability to distinguish between fantasy and reality. Leaders with this condition tend to view themselves as world figures capable of bending history to their will, and the blueprint they have in mind for reshaping the world is typically a dangerously simplistic, narcissistic and psychopathic vision. Adolf Hitler’s narcissistic fantasy, as laid out in Mein Kampf and later enacted in the Second World War, saw the ‘true’ international order as one where ‘pure’ nations fought to the death. In his view, war was a means by which the strongest nations on earth assumed their rightful position as overlords. In preparation for such a war, nations must ‘purify’ themselves of their ‘polluting elements’—whether Jews, homosexuals, the disabled or ‘inferior’ races. Hitler’s ambition was to conquer Europe and eliminate the ‘inferior’ populations of Russia and Eastern Europe, while retaining a minority as slave labour, becoming ‘Emperor of all Europe’ in the process. In pursuit of this fantasy, tens of millions of people were killed. That the world is a dangerous and threatening place; that alliances are treacherous; and that only strong nations standing alone can survive. That in this dangerous world the ‘superior’ white Christian civilisation is existentially threatened by ‘inferior’ civilisations, chiefly non-white people, Islam and China. And that under these circumstances, the US must ‘purify’ itself, build up its military strength and seek new alliances with ‘strong’ powers in place of the ‘weak’ nations with which it is currently aligned. That America must therefore seek the dissolution of its alliances with NATO and its small East Asian allies, along with the breakup of the European Union, and form a new and stronger alliance with white Christian Russia. 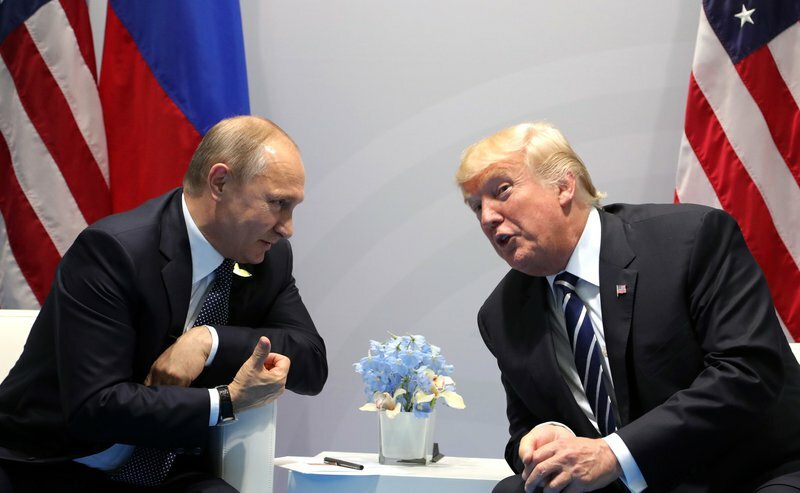 And that an alliance of the US and Russia, which would command 92 percent of the world’s nuclear weapons, would be unassailable in the coming confrontation with Islam and China. In this narcissistic fantasy, Donald Trump would become ‘Emperor of the World.’ But while this may be a fantasy there’s a definite logic to it, albeit one that is distorted and pathological. Malignant narcissism is a dangerous mental disorder. In their quest for and exercise of power, the malignant narcissist’s greatest weapon is the fact that psychologically healthy people are not able to believe that any individual could harbour such insane ideas. But our tendency to dismiss the unthinkable without serious consideration leaves us without a frame of reference to interpret and address the malignant narcissist as they relentlessly pursue objectives that are clear and consistent. Our refusal to think the unthinkable leaves us confused, disoriented and unable to resist effectively. History clearly shows how extreme the danger from malignant narcissistic leaders can be. Tyrants such as Hitler, Stalin and Mao each displayed traits associated with psychopathy, extreme narcissism and acute paranoia. The lethal mixture that each of these leaders displayed in terms of their total disregard for human life, their pathological paranoia, their narcissistic inability to doubt their own beliefs, and the pathological fantasies that propelled them, were significant factors that led to the Holocaust, the Gulag, and Mao’s Great Famine. If, as it appears, Trump came to Europe to undermine NATO and align the US more closely with Russia, we urgently need to begin to think the unthinkable, before the unthinkable happens again. The NATO Summit and Trump’s meeting with Putin should mark a turning point in the Republican Party’s support for this dangerous President. Recognising that a distorted logic may be driving Trump’s every decision should unite democrats on both sides of the aisle to curb his actions and remove him lawfully from power.